How come I can see the board, but can't add cards or make changes? If you're able to see your team's boards but not able to move or add cards, comment, or edit the board in any other way, you most likely aren't a member of that board yet. Being a team member allows you to see the boards and members that are part of that team, but it doesn't automatically give editing access to individual boards. If the board's settings allow it, the quickest way to become a member of the board is to add yourself. To do that, open the board, and click on the "Show menu" link to open the board's menu (if it's not already open). Then, look for a "Join Board" button underneath the list of members. If you see that button, you can click on it to become a member of the board. Click the "Join Board" button to add yourself to a team board. The blue chevron indicates the board admin. Once you've been added as a member, you'll be able to make changes to the board. How come only team admins can edit this board? It sounds like your team may have Trello Business Class. With Business Class, team admins automatically have admin control over every board in the team, even boards they're not a member of. However, since you probably don't actually want every member of the team to be an admin, we'd suggest adding those members to the specific board you want them to be able to edit, from the board's menu. Then, you can change them back from admins to normal members. I'm already an admin. Why can't I add or move cards? Although team admins of a Business Class team have admin control over every board in the team, team admins and board admins are separate in the free version of Trello. Even if you're an admin for the team, you'll need to be a member of the board itself in order to add cards or edit that board. Why can't the person I invited make any changes to the board? They may not be a member of that board yet, even if you invited them to the team that board belongs to. You'll want to add them to the board itself so that they can add and edit cards on that board. You can also open the board's settings (Board Menu → "More" → "Settings") and make sure that "Allow Team Members to Join" is checked. 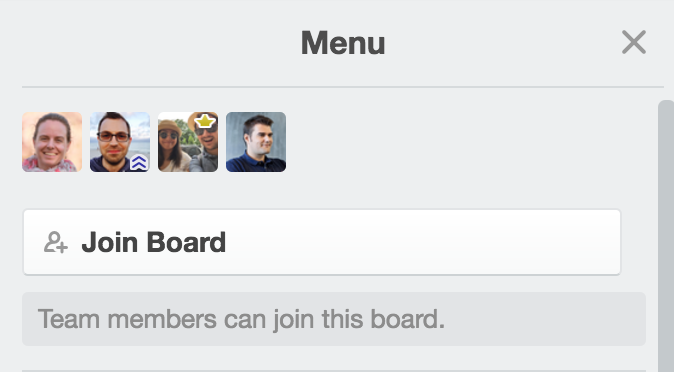 That will add a "Join Board" button that will allow team members to add themselves to the board.